Benny Goodman Takes Jazz From The Nightclubs To The Concert Halls Eighty years ago, barriers were broken when Benny Goodman took a mixed race band to play jazz to Carnegie Hall. Clarinetist and band leader Benny Goodman, photographed in 1959, made history as the first musician to perform jazz with an integrated band in Carnegie Hall in 1938. 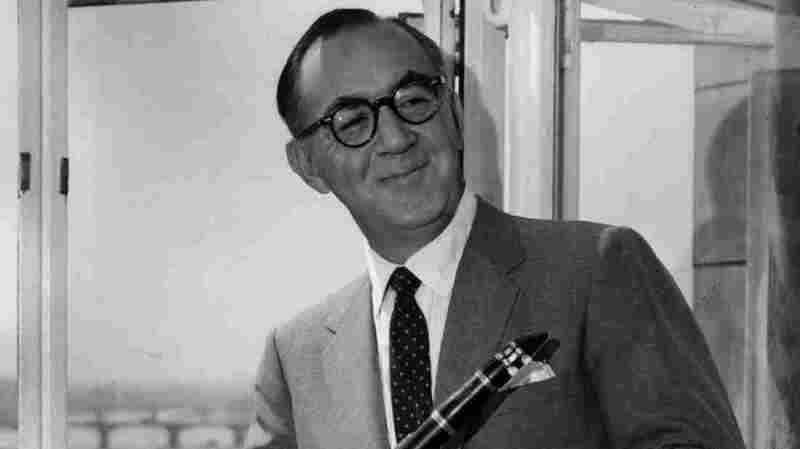 By 1938, clarinetist Benny Goodman was already known as "The King of Swing" — the leader of the most popular dance band in America at a time when swing jazz was America's most popular music. But nobody knew how it would be received in Carnegie Hall, America's temple to classical music. "That January 16th back in 1938 was a Sunday, and a cold one," Goodman recalled in a commentary recorded 12 years later. "We didn't quite know what would happen. How we would sound. What the audience would think of us. Until they got there, we didn't even know how many people would be on hand. So we just went out and played." The concert was recorded, but there were no plans to release it. "Benny Goodman's Carnegie Hall Concert of January 16th, 1938, historically, is the most important concert in jazz history," says Phil Schaap, curator of Jazz at Lincoln Center. Schaap produced the Columbia Records album reissue of the 1938 concert and says the event – with no dancing and no booze — elevated jazz to an art form. "The Goodman concert at Carnegie Hall is the cornerstone to jazz having performance space in the concert hall," Schaap explains. "But most importantly, aesthetically, it establishes that jazz has value for listening purposes only." The musicians sensed the importance of the event that night and they were nervous. Schaap says drummer Gene Krupa knew how he broke the ice. "Krupa senses something's wrong," Schaap says, quoting the drummer. "'I knew I had to do something. So I had my drum breaks. So I just hit everything I possibly could. Made a lot of noise. It woke everybody up. From then on it was smooth sailing.'" The concert turned out to be such a hit that Goodman went back to Carnegie Hall a few months later, and again the following year. There have been re-creations over the years, including one last week at New York's Jazz at Lincoln Center and another planned later this week by the Sacramento Jazz Orchestra. At a 30th anniversary celebration in 1968, Goodman insisted that for him, the Carnegie concert was just another gig. "So it never crossed our mind to think that on the night of January 16 we would give a jazz concert that would turn out to be a historic occasion," Goodman said. Outside of music, the concert was culturally historic. In 1938, music venues were segregated. But Goodman took more than half a dozen African American musicians with him onto the Carnegie Hall stage, including pianists Teddy Wilson and Count Basie, vibraphonist Lionel Hampton and saxophonist Lester Young. Benny Goodman made a stand for integration onstage nine years before Jackie Robinson broke the color barrier in baseball. "Benny Goodman deserves a lot of credit because he did this not with the idea of being commercial or for any money," Lionel Hampton said at the 30th anniversary celebration. "He did it for the feeling in the heart. He said we need the white keys and the black keys to play together to make good harmony. And that's what he did." But at that same celebration, Benny Goodman said it was a once-in-a-lifetime event. He didn't think the concert could be re-staged with the same effect. "I think it was a particular time, a particular thing. And that was it," he said. When Benny Goodman's The Famous 1938 Carnegie Hall Jazz Concert was finally released in 1950, it became one of the first LPs to sell more than one million copies. Times have changed, but the music can still bring people together. Anat Cohen, a 38-year-old Israeli-born clarinetist, played Goodman's parts at last week's Jazz at Lincoln Center re-creation of the 1938 concert. "This music is alive! And when you hear it live, it's current and it's happening; it's vivid and it's happy and it's swinging," Cohen says. "No matter at any moment. Since the '30s, up to today. It doesn't matter who plays it. When you play the music, the spirit of this music is always current." Saxophonist Lester Young did perform with Benny Goodman on the Carnegie Hall stage in 1938, but the saxophone solo during "One O'Clock Jump" that is heard in this story was played by Babe Russin.